Garuda, eagle-faced son of sage Kashyapa and vinata, had strength that surpassed all the devas in Indralok. So when he was required to bring the plot of Amrit or Nectar of Immortality, to save his mother from slavery, Indra's heaven shuddered with fear. This story is from the Adi Parva of the Mahabharata. Garuda is a mythical bird and has been held in great veneration in India from time immemorial. Many Indologists hold that this deity is of Dravidian origin. A stone flag-post, often ocovered with a metal plate, with an image of Garuda on top is invariably erected in front of the image of the deity in all Vaishnavaite temples. Besides this, another huge idol of Garuda is often installed in most Vaishnavaite temples, as he is considered to be one of the greatest devotees of Lord Vishnu. During the Gupta age, which is referred to as the golden era of Indian history, the Imperial standard had a Garuda image on it. Garuda is represented as a large white-necked eagle, but his images in the temples show him with a human trunk. Serpents are the natural food of the eagle. 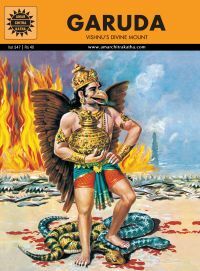 The reason for this enmity is traced in the Adi Parva of the Mahabharata to the jealousy between Kadru and Vinata, the mothers of the serpents and Garuda respectively.Only Vishnu could have these two born enemies - Garuda, the mighty eagle and Shesha, the great serpent - wait upon him. He uses Shesha as his couch and Garuda as his mount.